Daniel Kahneman is a Senior Scholar at the Woodrow Wilson School of Public and International Affairs. He is also Professor of Psychology and Public Affairs Emeritus at the Woodrow Wilson School, the Eugene Higgins Professor of Psychology Emeritus at Princeton University, and a fellow of the Center for Rationality at the Hebrew University in Jerusalem. He has been the recipient of many awards, among them the Distinguished Scientific Contribution Award of the American Psychological Association (1982) and the Grawemeyer Prize (2002), both jointly with Amos Tversky, the Warren Medal of the Society of Experimental Psychologists (1995), the Hilgard Award for Career Contributions to General Psychology (1995), the Nobel Memorial Prize in Economic Sciences (2002), the Lifetime Contribution Award of the American Psychological Association (2007), and the Presidential Medal of Freedom (2013). 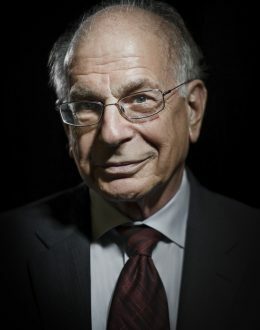 Dr. Kahneman holds honorary degrees from numerous Universities. In 2015 The Economist listed him as the 7th most influential economist in the world.